PDF2PRINT is a subscription-based scriptable server tool used for printing PDF files quickly and easily. It provides complete control over the print process including commands for page orientation, tray selection, and merging multiple input files. 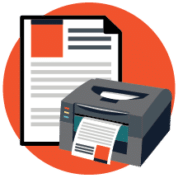 PDF2PRINT provides enterprise-level integration for server-based automated batch process workflows, while achieving fast and efficient printing with exceptionally small PostScript spool files - especially important for remote/offsite print workflows. All print settings can be managed seamlessly with commands through the PDF2PRINT tool with customization options and functionality to provide users with the ability to specify page orientation (portrait, landscape, auto), select specific input paper trays, and merge multiple PDF files into a single print job. "PDF2PRINT dramatically improved our remote print process with its unique ability to generate significantly smaller spool file sizes (up to 30x smaller) while maintaining a high-quality document output, resulting in faster print throughput, greater efficiency and cost savings." For all other PDF2PRINT Developer Resources, visit our Developer Resources area. You can expand your bulk print capabilities with PDF2PRINT to include an API.